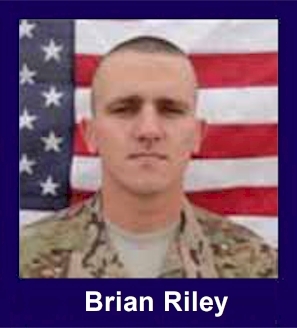 The 35th Infantry Regiment Association salutes our fallen brother, Brian D. Riley Jr, who died in the service of his country on May 15th, 2011 in Kunar Province,Afghanistan. The cause of death was listed as Non-Combat Related Incident. At the time of his death Brian was 24 years of age. He was from Binghampton, New York. SPC Riley was born in Binghamton, New York on Feburary 1, 1987. He grew-up in Longwood Florida and enlisted in the United States Army on 22 January 2008. He received his Basic Combat Training and Advanced Individual Training at Fort Benning Georgia. He arrived to Headquarters and Headquarters Company, 2-35th Infantry Regiment on 06 June 2008. During his tenure in the Cacti he held the posiitons of Scout, Operations Assistant, and Personal Security Detachment for the Command Group of Headquarters and Headquarters Company. He was serving his second deployment wiht the Cacti Battalion, his first being Operation Iraqui Freedom, 2009-2010. SPC Riley's awards and decorations include: the Army Commendation Medal (1OLC), Army Good Conduct Medal, National Defense Service Medal, Afghanistan Campaign Medal with Campaign Medal, Global War on Terrorism Service Medal, Army Service Ribbon, Overseas Service Medal (Numeral 2), NATO Medal, and Combat Infantryman Badge. SPC Riley died of wounds while in support of Operation Enduring Freedom in Kunar Province, Afghanistan. He is survived by his wife Samantha J Martin, daughter Trinity,his father Brian D Riley Sr., and mother Mary E Woodrow. also many brothers, sisters, aunts, uncles and friends. He was assigned to the 2nd Battalion, 35th Infantry Regiment, 3rd Brigade Combat Team, 25th Infantry Division. He was supporting Operation Enduring Freedom in Afghanistan. Funeral services will be held Thursday, May 26, 2011 at 1:00PM at the Fischer-Scholder Funeral Home, Inc., 269 Chenango St., Binghamton NY with Pastor Gordon Brownlow officiating. Burial will be in Glenwood Cemetery with full military honors. The family will receive friends at the funeral home Wednesday from 2:00-4:00 and 7:00-9:00PM.